The US Census Bureau has multiple efforts that involve states and territories. Four permanent, ongoing partnerships are State Data Centers, the Federal-State Cooperative for Population Estimates, the Governors’ Liaisons Network, and the Redistricting Data Program. These partnerships enable the Census Bureau to reach state leaders and stakeholders, transmit data to the states, improve data collection, and extend expert guidance and access to Census data and products. Established in 1978 for data assistance to state and local governments and the general public. 56 State Leads, representing each state, the District of Columbia, Puerto Rico, and US Island Areas. Supported by 1,600 coordinating agencies and affiliates, which include local governments, university research centers, libraries and nonprofits. 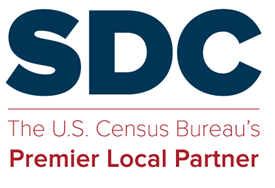 Members are premier partners who extend Census’s reach and provide Census products, data, and training resources to interested audiences and the general public. Support various Bureau programs including BAS, LUCA, Building Permits, and Census of Governments. Provide feedback on data users’ needs and operational issues. At the Census Bureau, the SDC program is coordinated by the Customer Liaison and Marketing Services Office. A steering committee representing the states works with Census Bureau staff to identify priorities and coordinate activities. Established in 1967 to assist the Census Bureau with state and local population and housing unit estimates. 56 members representing each state, the District of Columbia, Puerto Rico, and US Island Areas. Members are demographic experts who provide their local knowledge and insight to the Population Estimates Program, the media, and the public. FSCPEs supply vital statistics, information about group quarters (such as college dorms or prisons), and housing unit components. FSCPEs support efforts to improve the accuracy and timeliness of Census Bureau estimates by reviewing and providing comments on the population and housing unit estimates and methodology. Participate in Decennial Count Review. At the Census Bureau, the FSCPE program is coordinated by the Population Division. Staff or appointees of governors, representing the governors of each state, Puerto Rico, and US Island Areas, and the mayor of District of Columbia. During the 2020 Census cycle, the Governors’ Liaisons are a conduit for official communications. Communications include news of upcoming phases of preparation and Census activities in states, as well as discussions of state participation in 2020 Census partnership programs and geographic programs. Throughout the decade, Census Bureau keeps the Governors’ Liaisons informed of the planning and implementation of the Economic Census, the Census of Governments, and major household surveys. At the Census Bureau, the Governors’ Liaisons List is coordinated by the Intergovernmental Affairs Office. There is not a steering committee of participants. The roles of State Data Centers, FSCPEs, and Governor’s Liaisons may be overlapping. In some states, a single office may participate in two or three of these roles. 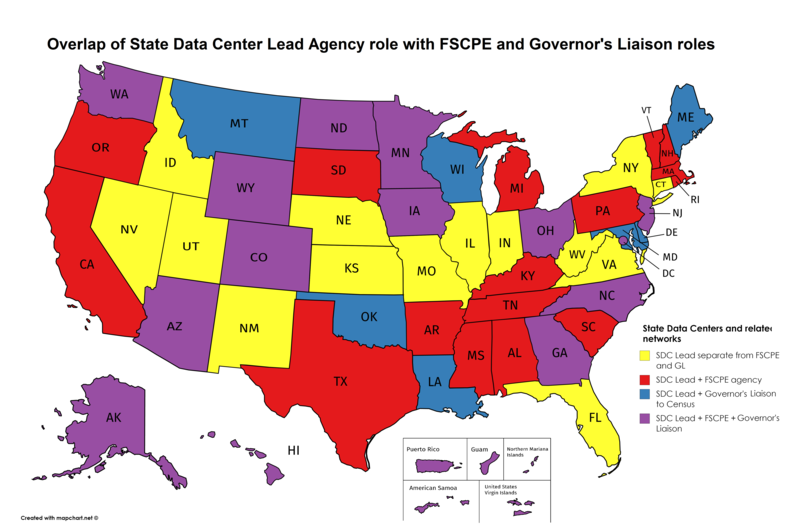 The map below identifies states and territories where the State Data Center lead agency also has staff who serve as FSCPE members (red), or Governor’s Liaisons (blue), or both (purple). Source: State Data Centers survey, October 2017, and census.gov. This information is self-reported by SDC state leads. Information may change over time as governors reassign roles. Please notify our webteam of corrections. State officials responsible for legislative apportionment or districting in each state and Puerto Rico. During the 2020 Census cycle, this geographic designation program provides opportunity to specify the geographic bounds of legislative districts, voting districts, and related areas needing tabulations of population. The specification, transmittal and receipt of tabulations is a nonpartisan process that follows the political decisionmaking to establish or modify legislative and voting districts. The US Census Bureau will deliver the specified 2020 Census tabulations to Governors and public bodies (Legislatures or Commissions) no later than April 1, 2021. The Redistricting Data Program continues throughout the decade. State participants have a biennial opportunity to specify changes to legislative districts. At the Census Bureau, the Redistricting Data Program is administered by the Redistricting Data Office. This entry was posted in Sharing, Tips and Documentation and tagged Experts, FSCPE, Governors' Liaisons, Redistricting.